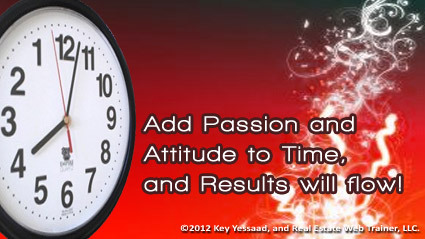 The challenge of Time Management that most Real Estate Agents and Brokers face lies deeper within their passion than the physics of time itself. The river of Time flows equally for all of us, but there are some who infuse their day with passion and desire, and this fuel has them accomplishing much more than those who only tackle tasks robotically. If you Door Knock with the attitude that you don’t want to be there, guess what you will get? People will not talk to you and then you will conclude that Door Knocking doesn’t work. If you attend a training because someone forced you in the room you will gain very little, and of course you will conclude that Trainings don’t work. I can go on, but you get the picture… The enthusiasm with which you create your goals and work on them daily, will lead you naturally to the steps and tasks you need to get closer to achieving them. Yes your heart matters if you wish to master you daily activities and become an efficient Time Manager.